England's Mat Turner and New Zealand duo Tomasi Cama and Frank Halai have been shortlisted for the IRB Sevens Player of the Year award. Turner, 24, has enjoyed a spectacular season, scoring eight tries in six games at last weekend's Glasgow Sevens, where England were beaten 29-14 in the final by New Zealand. One of 12 full-time contracted sevens players on England's books, he has scored 33 tries this season - two less than team-mate Dan Norton, who leads the series try table going into the season-ending London Sevens this weekend. "It's a real honour to be nominated and to be held in that regard by your peers," said Turner, who is vying to join Simon Amor (2004) and Ollie Phillips (2009) as English winners of the award. "My form's been good this season but I get put in the position to score the tries and it's a team effort. I've just found myself in the right place at the right time - so I can't complain about that!" Fijian-born playmaker Cama is up for the award for the second year running, having lost out to South Africa's Cecil Afrika last season. Cama's sharp rugby brain and astute Sevens acumen has once again been a key factor behind New Zealand's drive for a 10th World Series success. He is also currently the season's top point-scorer with 330 and has 28 tries to his name. Giant wing Frank Halai has also touched down 28 times for the New Zealanders this season. His powerful presence out wide has often proved the difference for the Kiwis, no more so than at their home event in Wellington and also in Port Elizabeth, where they won back to back titles. 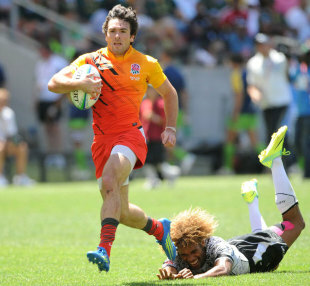 "Between them, these three players perfectly sum up the skill, excitement, pace and power on show in our magnificent Olympic game of Rugby Sevens," said IRB Chairman, Bernard Lapasset. "All three have been outstanding players and sportsmen this season and to be shortlisted by the teams they have played against shows just how significant their individual contributions have been." For the first time, fans have the chance to vote on the shortlist on the official World Series Facebook page. The results of the public poll will be considered, along with votes from core team management, when finalising the winner.